In this part we focus on LaTeX, how to use with Overleaf, and we compare it with Markdown and reStructuredText which can be used e.g. with Pandoc. Overleaf is a freemium cloud platform with core processing backend - LaTeX - which is open source software. Overleaf project can be downloaded as a ZIP file of text files and images which can be processed on any computer with LaTeX installed. Typical LaTeX installation consist of several backend (command line) tools such as tex or pdflatex and a dedicated text editor, for example Texmaker or Kile, which understands the LaTeX syntax and can compile the files into an output document, typically PDF. Thanks to this, Overleaf is a cloud platform which provides users with a way out, thus preserving their freedom (in the area of software, tools, and service providers). Overleaf also has a rich text mode which is good for people who don't know LaTeX. 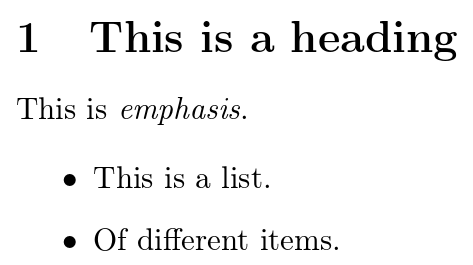 \item This is a list. What is LaTeX? LaTeX is a typesetting system or simply a program for creating text documents such as scientific papers or posters. Generally speaking LaTeX is a desktop publishing (DTP) program. How to pronounce LaTeX? The La at the beginning is coming from original author Leslie Lamport who extended TeX. The X at the end is an uppercase Greek letter chi. In English, LaTeX is usually pronounced lah-tekh, lah-tek, or lay-tek. What is LaTeX good for? The usage is very broad. It is most commonly used for technical and scientific texts such as scientific papers, dissertations, books and textbooks. It is also used for presentation slides or scientific posters. The code can be easily generated e.g. 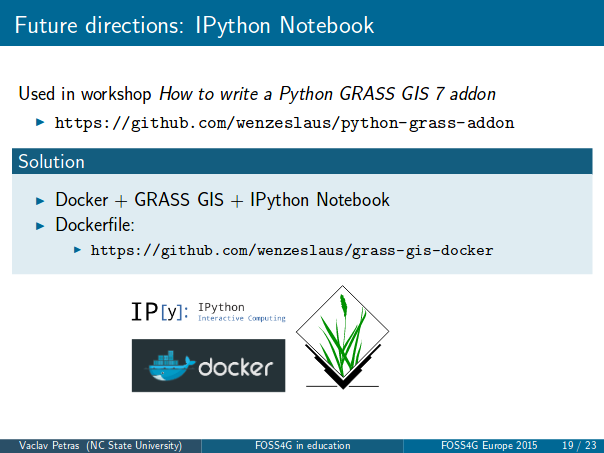 in Python, so it is used for automated generation of PDFs. What LaTeX does? Besides common formatting of text such as cursive and bold, LaTeX can automatically create table of contents, numbered headings, cross references, footnotes, and literature citations. 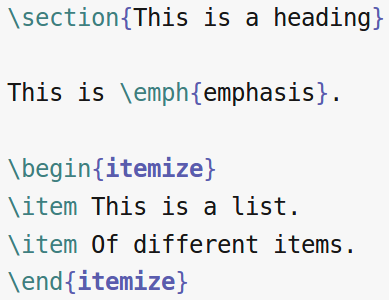 Advantages of LaTeX are best visible when creating numbered list and bullet points as everything is very organized and controlled. When using LaTeX you don't have to think much about typographic rules or know them because LaTeX will take of it. What is LaTeX best know for? LaTeX is often highlighted as a tool to typeset math equations and the LaTeX syntax or LaTeX itself is used in other tools to create math equations. LaTeX is also generally better than other tools in typographically perfect justification of text into block where LaTeX automatically and reliably hyphenates words in different languages. What are the limitations of LaTeX? The workflow usually requires The functionality of LaTeX is practically unlimited since it is a full programming language. If LaTeX can't do something, user can always program it to do it. Generally, this is of course not practiced because there is a large amount of packages which usually already cover the functionality you wish for. Do I have to remember all the commands? That's not necessary, because the common commands can be included using a button in a editor. For complicated and less common commands, people usually use existing examples online. What is the bare minimum I need to learn? The important part are the concepts, not the exact commands. First part is to become comfortable with textual representation of the formatting, for example that the bold text is not in bold in source text but it is marked with the specific command. Another part is that everything is a command. Creating a table of contents is as simple as writing bold text, it is one command. What is the difference between LaTeX and a text editor? First, LaTeX is not a text editor. It is a program which creates PDF or other documents from plain text files which contain LaTeX commands. It is focused on text, not graphics, but it is actually quite powerful in creating graphics as well. LaTeX is commonly used with a text editor which understands LaTeX and supports user in writing LaTeX documents. Things related to the text file such as spell checking are handled by the text editor (rather than LaTeX). How is LaTeX used without Overleaf? As users, we write text in a text editor which supports LaTeX. 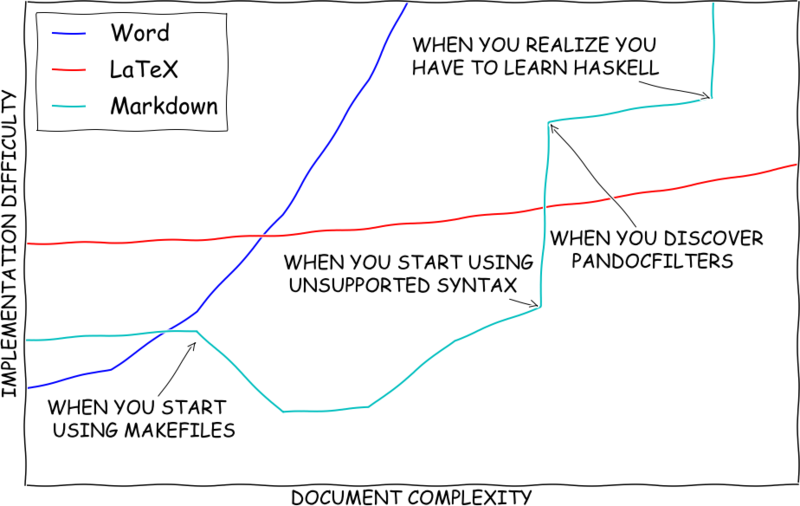 Whenever we run LaTeX (e.g. using a button or shortcut the in editor), LaTeX creates a PDF document (typically) which can be viewed in a PDF viewer (or embedded viewer in the editor). How LaTeX works? As users, we add tags (or commands) to the text which tell LaTeX how to process and typeset the text. It is similar to how HTML and web browser work when formatting web pages. 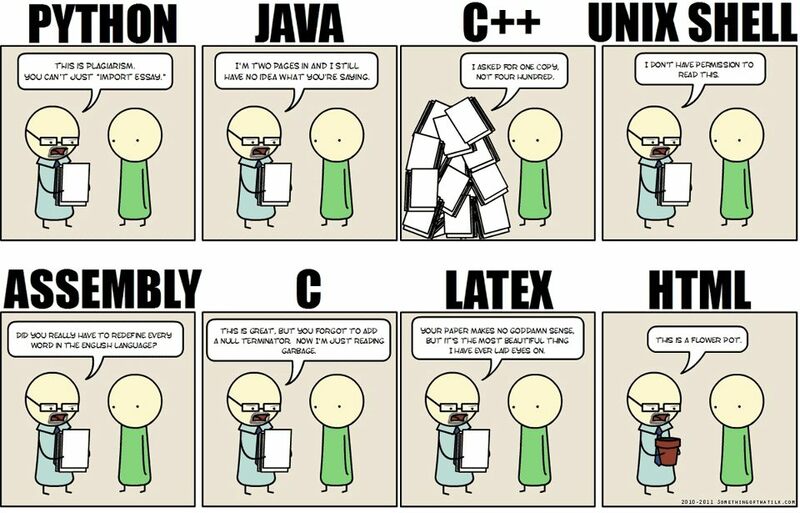 A very "scientific" comparison of Word, LaTeX, and Markdown. This figure is from Writing Technical Papers with Markdown © 2015 Dheepak Krishnamurthy. 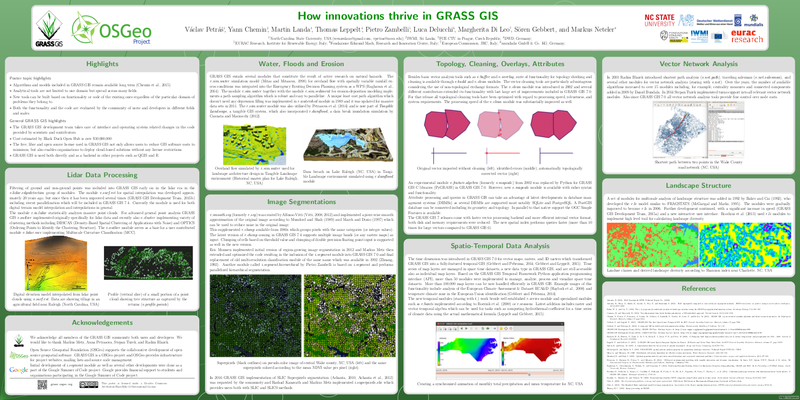 An example of a poster created in LaTeX using tikzposter package. An example of one slide from a set of presentation slides created in LaTeX using beamer package. 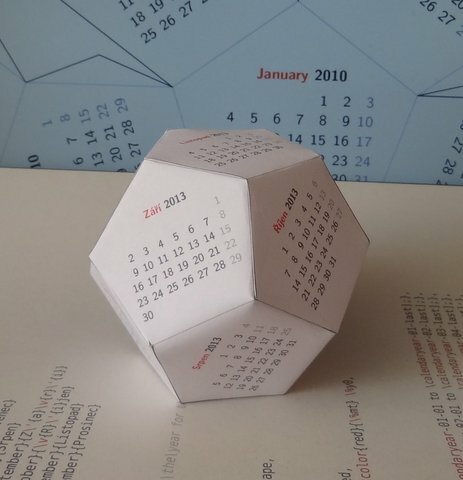 Calendar as dodecahedron created in LaTeX using tikz package as an example what can be done. See it at TeXample.net or in Overleaf. ShareLaTeX is a freemium cloud platform and an open source software (i.e. you can either use the freemium cloud platform or setup ShareLaTeX on any server). ShareLaTeX is under GNU AGPL license. You can use LaTeX in ShareLaTeX in the same way as you can use it in Overleaf. Markdown is a simple markup language for include formatting into a plain text document. Pandoc is a conversion tool which can convert Markdown files and many other files into other formats. Pandoc is licensed under GNU GPL. reStructuredText is an plain text markup syntax similar to aforementioned Markdown. It is often used for software documentation, for example in Python docstrings. reStructuredText is, unlike Markdown, designed for extensibility for specific application domains. reStructuredText is applicable to non-trivial cases like LaTeX, but still striving to keep simple syntax like Markdown. Docutils is an open-source text processing system for processing plain text into formats, such as HTML, LaTeX, man-pages, open-document or XML. Docutils processes reStructuredText and can be used from command line or as a Python package. Another software which can process reStructuredText in a similar manner is Pandoc. Sphinx is a tool that creates documentation from reStructuredText sources. It is used for Python documentation and it is universal enough to be used for software projects in general. The output formats include HTML, LaTeX (for printable PDF versions), ePub, and more. Sphinx uses the Docutils to parse the reStructuredText. Sphinx is licensed under BSD and Docutils are placed into public domain. Take some of your documents which contain headings, figures, tables, equations, and bibliography and recreate it in LaTeX. If you don't have a suitable document, you can use this paper_ or any other suitable document which contains all or most of the aforementioned elements. Scientific papers will usually work. If you are writing a report for assignment from another class, you can use that as well. In any case, you don't have to recreate the whole document, include just enough to try each of the elements. Three more alternative or bonus tasks: Create some other type of document in LaTeX other than a paper, for example poster or presentation slides (link a read-only version in the document linked above). Install LaTeX on your computer and try the workflow on your desktop instead of using Overleaf. Upload your resulting document to Overleaf and link it and describe in the above document what your installed and did and what were the other options you had. Use Pandoc, Docutils or Sphinx to create a LaTeX document from some other format such as reStructuredText. Again, upload and link the result and describe the process.